Though Apple hasn't advertised improved water damage protection for its new iPhone 6s series, the company has silently added a new perimeter gasket around the 3D Touch Retina display, as well as new silicone seals to cable connectors, that greatly enhance the device's ability to keep liquids out. New gasket around iPhone 6s display. Source: iFixit. 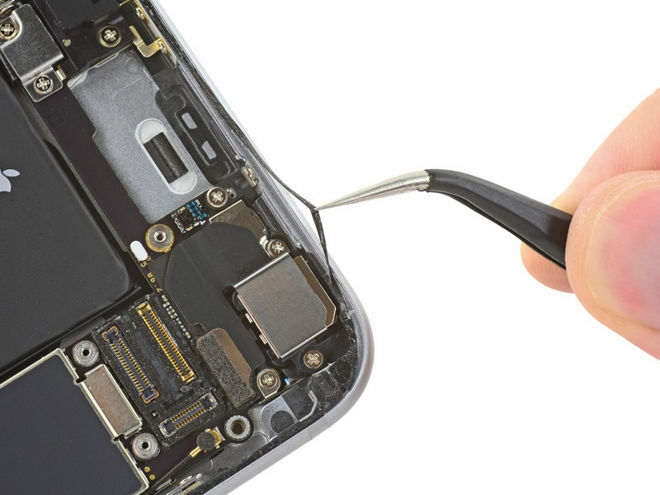 Apple reworked the frame of the display on the new iPhone 6s to fit the new gasket, iFixit discovered in a closer look at the handset's internal components. To accommodate this gasket, Apple increased the lip on the perimeter of the handset's frame by 0.3 millimeters over its predecessor, the iPhone 6. "One-third of a millimeter may not seem like much, but given how tight the iPhone's tolerances are nowadays, the change is big enough to see with the naked eye," the repair experts explained. "And it's almost certainly enough of a change that other components had to be subtly tweaked to match. Make no mistake, Apple gave this careful thought." 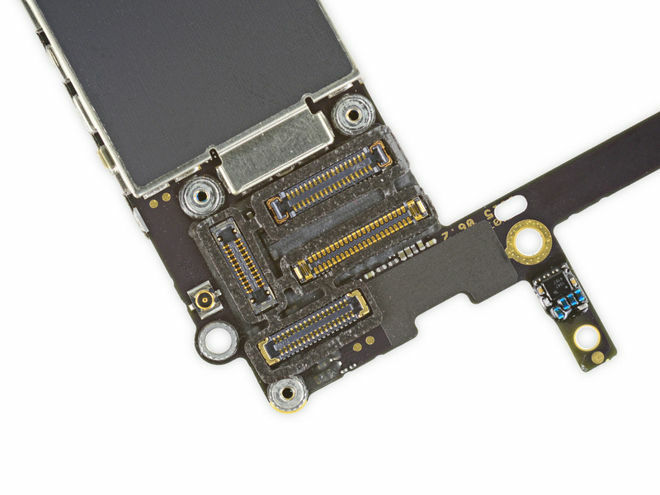 Digging even further, iFixit found that every cable on the iPhone 6s logic board is surrounded by a small silicone seal. These protect some of the parts that are most likely to fail when exposed to water, including the battery, display, Lightning port and buttons. This concept was detailed in a patent application detailed by AppleInsider earlier this year, in which Apple described ways to use silicone seals to protect solder leads, connectors, and flex cables within an iPhone. Silicone seals on iPhone 6s logic board cable connectors. Source: iFixit. The findings were backed by a popular YouTube video from Zach Straley, where both the iPhone 6s and iPhone 6s Plus were placed in a shallow bowl of water for an hour. Once the hour was completed, both handsets were removed from the liquid and found to remain in proper working order. While the iPhone 6s survived a shallow water test, a submersion in deeper water by iDeviceHelp found that the iPhone didn't fare as well, potentially helping to explain why Apple hasn't advertised the enhancements made in the iPhone 6s and 6s Plus. Revelations about improved water resistance in the iPhone 6s lineup come on the heels of a recent rumor suggesting Apple plans to utilize an even more comprehensive waterproof design for next year's so-called "iPhone 7." It was said that prototype next-generation iPhones feature design improvements intended to keep out both water and dust, suggesting Apple is toying with a more "ruggedized" handset for a 2016 refresh.